By this time, all the world is objecting to the proposal from G.M. 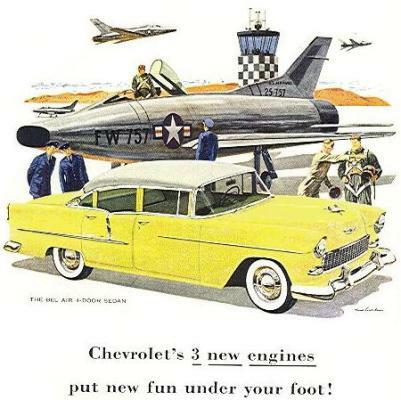 to dump "Chevy" and hew to "Chevrolet." it’s such a manifestly bad idea, it might actually be calculated to provoke the great linguistic love fest soon to follow. But we can take issue not just with the what of the decision but the why. Richard Chang of the Times gives us the memo from inside G.M. It comes from the desk of Alan Batey, vice president for Chevrolet sales and service, and Jim Campbell, the G.M. division’s vice president for marketing. I beg to differ. Brands did once labor to present the same face in every medium and all markets. In the second half of the 20th century, the world of marketing and especially design was all about consistency. This is what the corporation paid us for: to get their semiotic ducks in a row. That was the 20th century. Brands now want to be many things to many people. They are called upon to adapt in real time. Some overarching supervision is called for. But we want the brand to give off a certain vitality, vivacity, charisma even. And these things, as we know, come more surely from complexity than consistency. Naturally, this makes the marketer’s job more difficult. In the old days, once the choice was made, due diligence was all about policing the departures that were sure to spring up in every corner of the corporation. Now, it’s managing a bundle of sometimes discordant meanings, expressed with a variety of various visuals (and audibles). "Chevy" is a worthy part of this bundle. Nay, it has deep roots in American culture. This makes it a meaning most meaning managers would kill for. Chang, Richard. 2010. Saving Chevrolet means sending "Chevy" to dump. June 10. here. This entry was posted in Uncategorized and tagged adaptation, branding, brands, Chevrolet, complexity, consistency, Daniel Rosenblatt, design, Richard Chang on June 10, 2010 by Grant.